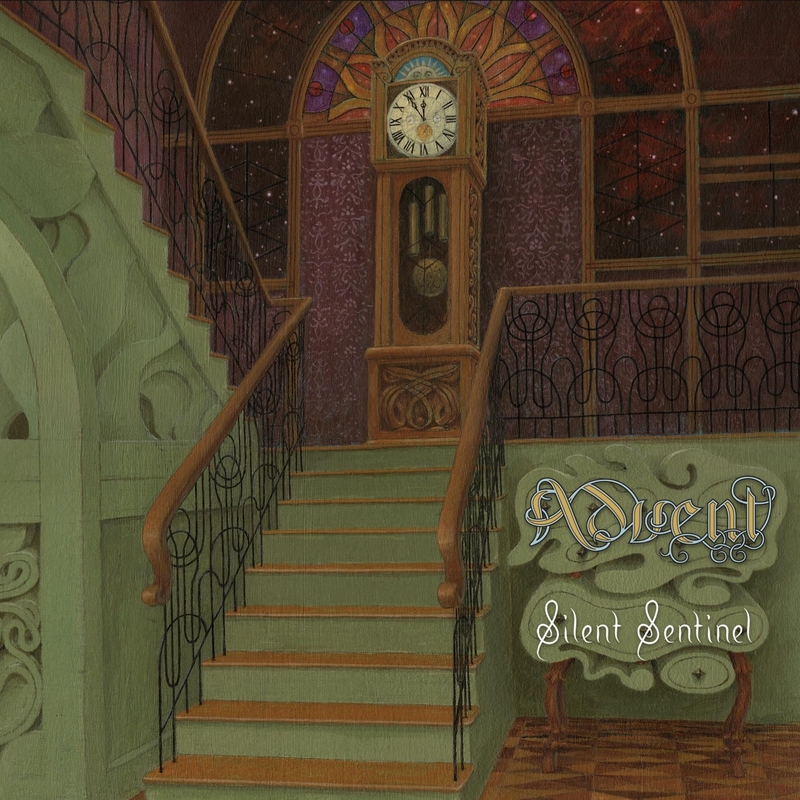 Advent, SILENT SENTINEL (released on August 11, 2015). Tracks: In Illo Tempore; On the Wings of an Ant (Verse 1); Voices from California; The Uncharted Path; Reloj de Sol; On the Wings of an Ant (Verse 2); The Silent Sentinel; 12/12; Sentinel’s Reprise: The Exit Interview; Second Thoughts; On the Wings of an Ant (Verse 3); and Romanitas. Advent’s third album, SILENT SENTINEL. Out August 11. Without question, this is one of the most interesting releases I’ve heard in a long, long time. I don’t mean there aren’t or haven’t been other incredible releases in the recent past. There’s no question that 2015 has turned out to be one of the finest years in the history of prog. This is high praise, indeed, as the last five or so years have been nothing short of mind-bogglingly good. By claiming that SILENT SENTINEL is interesting, I mean INTERESTING. Really interesting. There’s never a shortage of musicians doing the tried and true, just as there’s never a shortage of musicians trying to do something radically new. It’s rare that the former last long, and it’s equally rare that the latter can create something of beauty. The best art is always that which honors the past while making the old palatable to the present. This is where Advent admirably succeeds. SILENT SENTINEL is art, pure and simple. It’s also well-executed and beautiful art. It honors the past while making something old new. Over four decades of listening to prog, I’ve never heard anything quite like this new Advent album. I hear elements of Genesis, ELP, Gentle Giant, and A LOT of what sounds like Glass Hammer—at least in terms of music composition. What makes SILENT SENTINEL so fascinating is 1) its vocal lines; and 2) the intersection of its vocals and Glass Hammer like music. As it turns out, this is Advent’s third album. I must admit, I thought it was the band’s second. And, I’m more than a bit embarrassed about this mistake. I’ve been listening to what I thought was the band’s first, CANTUS FIRMUS, rather lovingly for years. I’m now eager to get the first album. My loss, and soon my gain. If I had to compare this new album to anything on the current music scene, I would definitely name it the cousin of the work of Babb and Schendel, as mentioned above. But, SILENT SENTINEL not a clone, by any means. And, I hope this doesn’t turn off any readers, but it must be said. This is Glass Hammer if someone were writing really artsy and innovative jazz mixed with some really good (not Marty Haugen!) liturgical music. There’s an element of Hebraic chant, but there’s an even stronger element of Palestrina-like music. Don’t worry: no one is screaming scripture at you. The religious element—as far as I can tell (as I don’t have the lyric sheet)—is in the music and vocal lines, not the words. I’ve said in half-seriousness for several years that CANTUS FIRMUS is Chestertonian prog. SILENT SENTINEL is more Tolkienian prog. I could easily imagine this music being sung in the First Age of Beleriand, most likely under the protection of Melian. It’s Sindarin Elvish, to be sure. As you can see—even from a cursory glance at the track listing—this is a joy, pure and whole. There are a lot of themes that repeat throughout the album, and there’s playfulness intermixed with intensity passages of beauty. The production of the album is especially crisp, with every instrument really shining forth as a part and as a part of a whole. Really, everything—drums, keyboards, guitar, and bass—sound perfect. And, it’s clear that the producer and sound engineer gave everything to make this cd work so beautifully. I have a feeling that no matter how many times I listen to this, I’ll be rewarded with hearing something new. While there’s nothing half-way done on the album, and I like it all, I’m most drawn to the epic title track, The Silent Sentinel. I’m not exactly sure what the context of the story is, but the music flows mysteriously and cinematically. I presume it’s a play on the title of the band, as Advent is a time of watchful waiting. Thus, the Silent Sentinel is a guard over time as well as space. Again, I don’t have the lyric sheet, but it sounds like there’s some real Homeric evil happening as well, with the guardian protecting the crossroads of this world and the next. I really can’t exaggerate or overstate how much SILENT SENTINEL grabs and intrigues me. It’s the kind of release that makes me not only proud to be a prog fan, but it actually makes me proud to be alive–to live at a time that produces such artists. This is the equal of Big Big Train and The Tangent in terms of quality, innovation, and beauty. Progarchists, SILENT SENTINEL is something truly special. Don’t let this release pass you by. Pre-order and prepare to be dazzled and downright overwhelmed. Bad Elephant Music — Prog Magazine sampler of great music! You could not have been more spot on with this review. Beautiful stuff.